Extra, extra! James O'Keefe releases video showing a major Democratic-leaning organization in Texas held meetings in which participants laughed at the disability of Republican gubernatorial candidate Greg Abbott. This, and far worse! At first blush this looked pretty bad for Wendy Davis and Battleground Texas. O'Keefe's Project Veritas was at it again, with one clip showing a woman saying she "didn't hear" a suggestion made about ballot fraud (she was supposed to make a citizen's arrest, right?) So that happened. Then, there was another lady mentioning she was concerned how the "Stand with Wendy " slogan might play against a disabled opponent, when suddenly a chortle is heard in the room. Nervous laughter? Nay, it sounds more like cruel mocking of the disabled! So that's two damaging things. That is, until you watch James O'Keefe's interview with Alex Jones' Infowars. There we find out there's no way of knowing whether those laughing on the tape or suggesting ballot fraud are really Wendy Davis devotees. In the interview, O'Keefe admitted he has "dozens" of his people planted in the organization. One clip even shows people calling Wendy Davis too stupid to be governor. Is this a coordinated campaign effort, or more like a random group of people in a room? Yes, O'Keefe, now relegated to wack-a-doo sites to promote his latest video, is trying to rassle up some traffic to show his benefactors. But beyond sites like TownHall, WND and The Blaze, this "viral" video didn't make it out of the right wing corral. So O'Keefe took to appearing on a show that warns of nefarious government blimps and sells products to protect against fluoridation in the water. 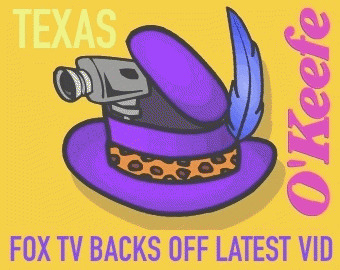 Ironically, O'Keefe made several disclosures that should absolve Battleground Texas rather than tarnish them. For example, O'Keefe bragged that he had collected "hundreds of hours" of video at Battleground Texas meetings, selecting some two hours of footage for his exposé. But this means that at least 90% of the time there was nothing going on - wouldn't any organization love to hear that an overwhelming majority of surreptitiously recorded tapes showed nothing of use to their opposition (particularly organizations who rely on volunteers that simply walk through the door). "It seems Battleground Texas and Wendy Davis' strategy to win the Governor's seat is to mock Attorney General Abbott's disability". O'Keefe is absurd to suggest the laughter coming from one person in this tape represented any part of the Davis campaign's "strategy". But suppose O'Keefe's plants were the ones on the tapes "priming the pump" to make the videos more scandalous. He's done it before. Could this be why Megyn Kelly backed out of showing the video on TV? Fox's Megyn Kelly initially promoted the video during Bill O'Reilly's show but she refrained from showing it on her show, instead using vague references to it in questions to egg on Greg Abbott. Why did Kelly reneg? Most likely because O'Keefe's videos have proven problematic before - his deceptive editing and "entrapment" situations showed how his plants propose wrongdoing to ensnare others. O'Keefe himself demonstrated this in his infamous sting video asking an ACORN worker to join his human trafficking and underage prostitution ring. After dragging out the lawsuit for years, O'Keefe and his pretend "ho" Hannah Giles were forced to pay an employee on the tape some $150,000 in damages. O'Keefe was hiding how many ACORN offices declined his offers or called the cops. A different Project Veritas video purported to show election fraud in New Hampshire, but ended up with O'Keefe almost facing fraud charges because clips clearly showed it was actually his videographers that were suggesting wrongdoing. Wendy Davis has called the reactions "abhorrent", but you can be sure that Battleground Texas will more closely watch what they say now, knowing some of the attendees at their meetings are secretly paid undercover videographers. O'Keefe described Battleground Texas as a movement stealthily funded by DC-based interests to turn Texas blue over the long term, but even if true, his operation runs on the same model, fueled by donations from wealthy partisans whose identities are kept hidden.